Hello guys today's i am going to show you how can you check your blog or website domain is banned or not banned from Google AdSense .Google AdSence is a best platform because it's offers you to earn money.Google Adsense Similar and provides many good services. From AdSense all bloggers around the world are benefiting from them.so viste any one ban checker website and check your blor or website domain status. 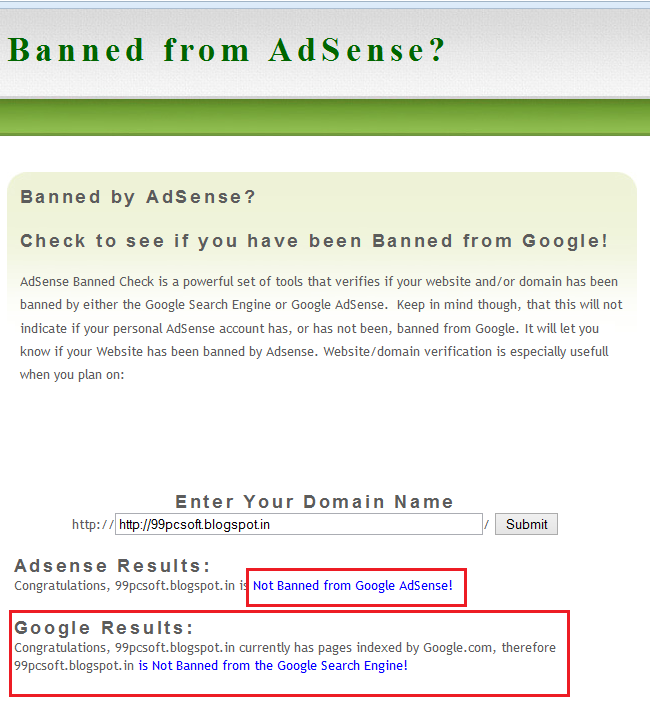 Adsense Results:Congratulations, 99pcsoft.blogspot.in is Not Banned from Google AdSense! Google Results:Congratulations, 99pcsoft.blogspot.in currently has pages indexed by Google.com, therefore 99pcsoft.blogspot.in is Not Banned from the Google Search Engine! :-It will transfer your domain to a new domain name. :-It will Sell your domain to someone new. :-Researching if an existing domain has been banned by AdSense. :-It will Check to see if your competition has been banned.